Jakarta Inflation Control Team (TPID) which consists of Bank Indonesia (BI) for Jakarta Representative, PT. Food Station Tjipinang Jaya, Maritime Agriculture and Food Tenacity (KPKP) Dept., and Economic Bureau explores for cooperation with Cilacap Regency, Central Java, in rice commodity sector.
" Our purpose for this visit is to build cooperation between regions"
TPID visit was welcomed by Cilacap Regent, Tatto Suwarto Pamuji. In this chance, BI for Jakarta Representative's Currency Management Department Deputy Director, Sithowati Sandrarini conveyed, this visit was done to build cooperation between regions. Because one of TPID main tasks is to be active in maintaining price stability. "We also build synergy with Jakarta Government. 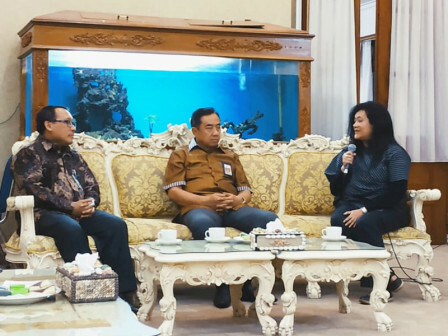 Our purpose for this visit is to build cooperation between regions," she said at Cilacap Regent Office, Jalan Jenderal Sudirman, Cilacap, Central Java, Tuesday (11/6). At the same location, PT. Food Station Tjipinang Jaya Operational Director, Frans M. Tambunan explained, one of TPID tasks and functions is to stabilize food commodity prices in the Capital. Thus his side wants to explore cooperation with Cilacap that has been known for its rice production. "We cooperate with many regions to get food supply for Capital. Hopefully our visit today gives a good result," he added. Meanwhile, Cilacap Regent, Tatto Suwarto Pamuji stated that his side open his arms widely for this cooperation. Especially this cooperation can give benefits for both sides. "We are welcoming this cooperation. Surely, each regencies has its own superiority," he conveyed.